On the evening of Thursday, January 31, 2019, the Coalition of Domestic Election Observers (CODEO), which had deployed observers for the Ayawaso West Wuogon Constituency by- election held on that date, released its Close-Of-Polls Statement. CODEO's Close-Of-Polls Statement typically provides a snapshot of what transpires on Election Day. Consistent with its practice, CODEO communicated its initial report of the election not only to the public, through traditional and new media channels, but also to the leadership of the Electoral Commission (EC) via e-mail. On Thursday, December 27, 2018, the Coalition of Domestic Election Observers (CODEO) deployed fifty (50) observers to various districts and constituencies in selected regions within which the referendum on the proposed creation of additional regions was taking place. CODEO observers visited an average of four (4) polling stations within their assigned districts in the course of the polling exercise. Observers spent between an hour and two hours at each polling station visited. Overall, the referendum took place in a calm and peaceful electoral environment. However, a number of electoral anomalies were recorded by CODEO Observers during the observation exercise. These anomalies raise serious questions about the integrity and credibility of the polling process in the observed polling stations. The Coalition of Domestic Election Observers (CODEO) will observe the referendum on the creation of additional six (6) regions, which takes place tomorrow Thursday, December 27, 2018. CODEO is deploying a total of fifty (50) observers to the various districts across the country within which the referendum exercise will take place. This is in line with CODEO's objective of promoting electoral transparency, accountability and credibility towards peaceful outcomes. On the day of the referendum, CODEO observers will visit various polling stations within their assigned districts, paying attention to key electoral processes such as the setting-up and opening of polls, verification and voting processes, close-of-polls and counting processes, as well as results collation. Observers will also focus on the conduct of election officials and other stakeholders including, security personnel and voters. In keeping with its objective of promoting electoral integrity in the country, the Coalition of Domestic Election Observers (CODEO) deployed five (5) observers to eight (8) districts in the regions where the exhibition exercise took place who observed the exercise for the entire duration of the exercise. The districts observed by CODEO included: Juaboso in the Western Region; Chereponi and Sawla-Tuna-Kalba in the Northern Region; Krachi West in the Volta Region; and Nkoranza North, Nkoranza South, Kintampo North and Kintampo South in the Brong Ahafo Region. CODEO observers visited a total of 31 exhibition centers within these eight (8) districts. This exercise follows CODEO's observation of the 2018 limited voter registration carried out by the EC from September 16-25, 2018. The Coalition of Domestic Election Observers (CODEO) has learnt, with deep sorrow, the passing of its Co-Chair, Justice V.C.R.A.C. Crabbe, whose death occurred this morning, September 7, 2018 after a short illness. CODEO expresses its deepest condolences to his family on this loss. Indeed, the entire people of Ghana have lost an illustrious son. Click on attached file for full statement. The Coalition of Domestic Election Observers (CODEO) has followed, with keen interest, public reaction following the announcement by the Office of the President on June 28, 2018 that the Electoral Commission (EC) Chairperson, Mrs Charlotte Osei, and her two deputies, Mr. Amadu Sulley and Mrs. Georgina Opoku Amankwah, had been removed from office. CODEO notes that the removal was based on the recommendations by the Committee established by the Chief Justice, pursuant to Articles 44(2), 44(3), and 146(4) of the Constitution, to investigate certain allegations contained in certain petitions submitted to the President in July 2017, asking for the removal from office of the Chairperson and two deputy Chairpersons of the EC. CODEO acknowledges that the President's action in removing the three officers of the Commission is in accordance with the process prescribed by Article 146 of the Constitution. In the interest of transparency and accountability, CODEO calls on the President and the Chief Justice to make available the full report of Chief Justice's Committee. Follow link below for full statement. The Coalition of Domestic Election Observers (CODEO) is deeply dismayed by the outcome of the investigations and judicial proceedings involving thirteen members of the 'Delta Force', a vigilante group associated with the ruling New Patriotic Party (NPP). The sentencing follows a case of the group's assault on the Ashanti Regional Security Coordinator, and the attendant destruction of public property that occurred at the Ashanti Regional Coordinating Council in March 2017. CODEO is concerned with the apparent weak quality of the official investigations into the case and the subsequent prosecution of the accused, which concluded with a sentence of a fine of GHC1, 800 for each or, in default, twelve months imprisonment. Follow link for more details. CODEO today, climaxed its ninth regional engagement in the nation wide confab on political party vigilantism in the Brong-Ahafo region with a formal statement via a press conference. The presser allowed CODEO to relay the reflections of various stakeholders (The Security, the clergy, traditional leaders, political parties, the media, the regional peace council, the regional bar association) in the region on this national security threat. Addressing the presser, CODEOs Ambassador Francis Tsegah restated CODEOs stance on political vigilantism, that "The existence of political vigilante groups is illegal and the Government should ban these groups immediately as a matter of national security". CODEOs Advisory Board member Mr. Nicholaus Akyire after highlighting manifestations of political vigilantism in the Brong-Ahafo region presented the solutions by stakeholders to curb this menace. 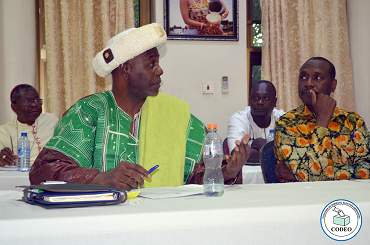 He pointed out that " The intelligence unit of the Security Services in the region should map out vigilante activities and develop specific strategies to deal with them, Political parties should develop more rules and regulations to govern the activities of their youth groups and Stakeholders particularly the media should name and shame politicians who form, fund and solicit for the services of vigilante groups. Click the link to read more. CODEOs nationwide Round Table Discussions on the menace of political party vigilantism made a stop in the Ashanti regional capital of Kumasi. After deliberations with stakeholders, a press confab was held to tease out the issues as expressed. Our stakeholders at the Kumasi confab suggested that 1. The independence of the IGP should be safeguarded through appointment to the office by an independent body and security of tenure for the office holder ensured. 2. The Electoral Commission (EC) is entreated to display professionalism in all aspects of its work and strive to ensure that adequate and quality training is provided for their staff including the temporary staff. 3. Political party leaders should desist from making unachievable promises to their followers. There is more in the full statement, click link to read or download. The Central regional capital of the Cape Coast took its turn to host the CODEO nationwide round table on the menace of political party vigilantism. After fruitful deliberations with our stakeholders at the Ridge Royal Hotel, a formal statement was released via a press confab today. On solutions to curbing this menace, our stakeholders noted that: 1. There should be security of tenure for the Inspector General of Police (IGP) and all heads of other security agencies. 2. Politicians should make realistic campaign promises to manage the high expectations of their grassroots supporters and finally as expressed in previous regional round table discussions, the Electoral Commission (EC) is enjoined to be more transparent, professional and independent in the conduct of its activities. The EC should open up to more consultation on critical electoral issues to avoid suspicion from stakeholders. Read more in the full statement released today. CODEO's nationwide train on the menace of political vigilantism hit the Western Region of Ghana. The oil city of Takoradi hosted CODEOs sixth press confab on Wenesday July 26, 2017 to relay the reflections of from as cross-section of stakeholders in the region. The statement which was presented to the media at the Grand Favor Hotel, Takoradi highlight some of the following recommendations 1. Public education and sensitization on civic values and patriotism should be re-introduced and given prominence in schools. 2. Political parties should as a matter of urgency put measures in place to regulate the conduct and activities of youth groups. 3.All criminal offenses should be separated from electoral offenses and prosecuted by the Police. Click the link to access the full statement released today. CODEO's nationwide train on the menace of political vigilantism made a stop in the Upper West regional capital of Wa. After engaging with stakeholders in four other regions, the CODEO team held the fifth confab on Monday July 17, 2017 at the Nuoyong Empire Hotel in Wa. A statement was released at a press conference to relay the reflections of the stakeholders. Some of the solutions proffered includes: 1. Security Services particularly the Police are entreated to show professionalism in their conduct and maintain political neutrality in the discharge of their duties. 2. Religious dialogue (at the inter-faith and intra-faith levels) needs to be considered seriously as one of the means of curbing political party vigilantism 3. Government should create more job avenues to absorb the unemployed youth. There is more in the statement below. 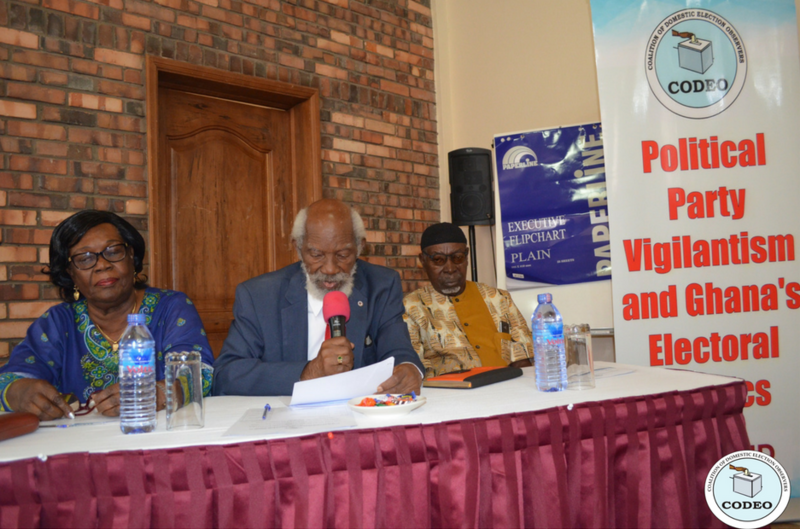 CODEOs nationwide round table discussion on the menace of political vigilantism hit the Upper East Region of Ghana. At the end of the stakeholder engagement, some suggestions were made on combating this menace. Stakeholders noted that: - Security agencies should be well resourced to be able to deal with the complexities of the vigilante groups. -Again, as in other regions, participants canvassed strongly for the position of the Inspector General of Police (IGP) to have security of tenure. -The Police Council should work to standardize the recruitment, promotion and transfer of police personnel in order to boost their confidence and be able to discharge their duties professionally against political manipulations. Read more in the statement. In the first of the nation wide Round Table Discussions on the menace of political vigilantism held on June 23, 2017 in Koforidua, CODEO stakeholders made some suggestions in combating this threat. CODEO calls on all stakeholders, including the political parties, security agencies, and the public at large to, as a matter of urgency, address this growing canker. CODEO calls on all Ghanaians to work together to support this crusade against political party vigilantism in our electoral politics. CODEO further calls on the media to make this subject critical for public discussion. Read more in the full statement. The Coalition of Domestic Election observers (CODEO), with support from the United States Agency for International Development (USAID), held a lessons-learned workshop from March 27 to 29, 2017 at the Aqua Safari Resort in Ada in the Greater Accra Region to assess the conduct of the 2016 Presidential and Parliamentary Elections. The workshop brought together a diverse group of election stakeholders to a single platform to take stock of the conduct of the 2016 Presidential and General elections and draw valuable lessons for improving the conduct of future elections. The participants at the end of the three-day workshop, identified accomplishments and positive lessons learned from Election 2016 that must be applied to future elections, pointed out gaps/concerns in the electoral process and made recommendations covering the voter register, enforcing electoral laws, civic/voter education, politically affiliated vigilante groups, election results coalition, transmission, announcement and declaration, elections and campaign financing. As part of its comprehensive observation and interventions to promote credible and peaceful elections, the Coalition of Domestic Election Observers (CODEO), with support from the United States Agency for International Development (USAID), is organizing a three-day workshop to assess the conduct of the 2016 Presidential and General elections. The workshop, which will bring together diverse election stakeholders to brainstorm on the 2016 electoral process, will also serve as the platform to take stock of valuable lessons from the conduct of the elections to help inform and improve the conduct of future elections. The workshop is slated for March 27-29, 2017. As was communicated to the nation in the pre-election statement on Tuesday, December 6, 2016, the Coalition of Domestic Election Observers (CODEO) employed the Parallel Vote Tabulation (PVT) methodology to observe the 2016 presidential and parliamentary elections, just as it did in 2008 and 2012. CODEO employed the PVT to independently verify the accuracy of the presidential election results as declared by the Electoral Commission (EC). As of midnight on Election Day, Wednesday December 7, 2016, CODEO was in the position to verify if the presidential results reflected the ballots cast at polling stations. The statement presents further details of the PVT and the results from using this methodology. This mid-day situational statement (a preliminary report) is based on reports CODEO has received from 1,486 out of the 1,500 PVT Observers (i.e. 99%) from every region and constituency as of 12:00PM today (i.e. Election Day). The Coalition of Domestic Election Observers (CODEO) has deployed about 8,000 trained, accredited, non-partisan observers. These observers are Ghanaians, from every walk of life who have volunteered their time to help ensure that every registered voter cast his/her ballot freely and unhindered on Election Day. Of the 8000 observers, 1,500 are Parallel Vote Tabulation (PVT) Rapid Response Observers (RROs). The report focuses on the set up and opening of polling stations as well as few incidences recorded as at the time of reporting. The Coalition of Domestic Election Observers (CODEO) is pleased to release its close of polls situational statement for today, December 7, 2016. This close of polls situational statement (a preliminary report) is based on reports CODEO has received from its Stationary and Roaming Observers as at 5:30PM. It is based on the initial information on the voting process. CODEO is able to make preliminary comments on the voting process on only those polling stations that had completed voting by 5PM. Once voting is completed at all polling stations, a comprehensive statement will be made on Thursday December 8, 2016. Observers reports received from 86% of polling stations indicate that 55% had no major problems during voting; 44% reported minor problems, and 1% reported major problems during voting. The Coalition of Domestic Election Observers (CODEO) has expressed optimism in the ability of Ghanaians to go to the polls peacefully and use tomorrow's elections as another opportunity to consolidate the country's democratic and electoral gains. Prof. Greenstreet reiterated that 'the December 2016 Polls offer Ghanaians another opportunity to rise above these challenges and prove to ourselves and the global community that we are determined to stay on the democratic path and deepen the development of our democracy. We must use this opportunity to elect our leaders and representatives to demonstrate our willingness to participate fully in the democratic process, and, above all, our commitment to accountable governance'. The Coalition of Domestic Election Observers (CODEO) is pleased to release preliminary findings on the Electoral Commission's (ECs) conduct of the special voting exercise across the constituencies on December 1 2016. The findings presented in this statement are based on field reports submitted by CODEO's Observers deployed in all 275 constituencies in the country. CODEO's observers used a checklist, to observe the preparations, voting processes, and electoral incidents among others. As part of its preparatory activities towards contributing to a generally peaceful and credible election in the upcoming December 7 polls, the Coalition of Domestic Election Observers (CODEO) is organizing training workshops for its Constituency Supervisors from October 25 to November 8, 2016. The training workshops, taking place in all regional capitals, mark the second phase of CODEO's preparations to recruit, train and deploy over 7,000 of its members who will volunteer their services as observers on Election Day. The NCCE-. CODEO and CDD-Ghana wish to express our sincere apology to parliamentary candidates, Gbawe Mantse. opinion leaders, the citizens of Gbawe/Weija constituency and our media partners for the unfortunate incident that occurred on Saturday, 22ndd October 2016 in relation to our joint mounting of a parliamentary candidate debate platform in Gbawe/Weija Constituency the Greater Accra region. In line with its objective of promoting credible and peaceful elections, the Coalition of Domestic Election Observers (CODEO) has launched a comprehensive four interrelated activities to support the upcoming presidential and parliamentary polls. At a launch ceremony in Accra, CODEO's project on the theme 'Civil Society Advocacy and Support for Credible 2016 Elections - A CODEO Project', as announced by its co-chairs Prof. Miranda Greenstreet and Prof. Justice V.C.R.A.C Crabbe, includes tracking and advocacy on the implementation of the accepted Electoral Reforms as announced by the Electoral Commission, domestic election observation, implementation of a Parallel Vote Tabulation (PVT) and the promotion of Civic and Voter Education at District Levels. The Coalition of Domestic Election Observers (CODEO) has received funding from USAID towards the implementation of 'Civil Society Advocacy and Support for Credible 2016 Elections - A CODEO Project' and intends to apply part of the proceeds to fund eligible payments in respect of the following lots. The Coalition of Domestic Election Observers (CODEO) will observe the exhibition of the provisional voters' register exercise to be conducted by the Electoral Commission (EC) of Ghana from Monday 18th July, 2016 to Sunday 7th August, 2016. CODEO, which will deploy a total of 275 of its observers, will observe the entire process of the exhibition exercise, including the setting up of the exhibition centers, opening of the centers, availability of materials, the functioning of equipment of the Biometric Verification Device (BVD), compliance with exhibition procedures, conduct of authorized officials and party agents. Ghana's only Nobel Peace Prize laureate and Chairman of the Kofi Annan Foundation, H.E. Kofi Annan is billed to speak on "Credible and Peaceful Elections: A Prerequisite for Africa's Progress" at this year's 'Kronti Ne Akwamu' lecture, the flagship annual democracy and governance event of the Ghana Center for Democratic Development (CDD-Ghana). Last week, the Inspector-General of Police (IGP), John Kudalor, declared that the Ghana Police Service (GPS) was considering a ban on access to social media platforms during the 2016 general elections. This intent, according to the IGP, is part of the Police Administration's plans to ensure peace during the election period. The Ghana Center for Democratic Development (CDD-Ghana) joins others in registering our strong and unqualified opposition to any such move.